Congratulations to "Bn100", the winner in Stephanie's giveaway. Thank you to all who participated! Coming out of hibernation, Danielle Shumaker has put behind her the pain and misery she’s caused Victoria and Joshua. Blinded by her selfishness her ultimate goal is still her main one. As far as Danielle’s concerned Joshua belongs to her, always has and always will. No amount of therapy can cure her love addiction and no matter what anyone says she will fight for him, even if she has to kill someone AGAIN. Wedding bells are in Victoria and Joshua’s future, Victoria is excited to be Mrs. Eubanks. However, when she closes her eyes at night, Greg invades her dreams, the passion and love leaves her wanting more and waking with doubt about her upcoming marriage. How will she get over this man or does she even want to? Stephanie Nicole Norris is an author from Chattanooga Tennessee with a humble beginning. She, along with her six siblings, was raised by her mother, Jessica Ward. Growing up a lover of reading, Stephanie loved to read books by R.L. Stine. She always had a natural talent for writing and 2010 was the beginning of her journey. 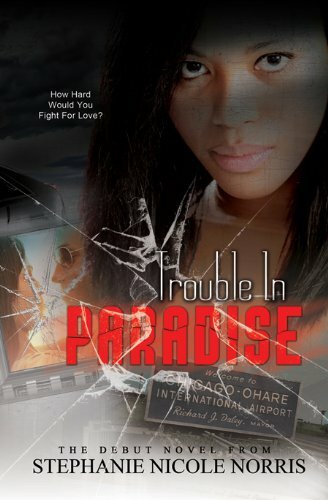 In early 2012, her debut novel, "Trouble In Paradise", was published. Seven months later, Stephanie released her sophomore title, Vengeful Intentions, which is part 2 of Trouble In Paradise. For Better and Worse, part 3 of Trouble In Paradise was released September 27, 2014, In the works is her first Christian fiction romance, "Catching Bees with Honey". She has a series of short stories that releases throughout the year called The Lunch Break series. These stories are not continuations of the same story and can be read in your lunch break hour. The Lunch Break series, which features titles like Wreckless and Broken, can be found on Amazon, Kobo and Barnes and Noble. Stephanie’s words tell stories of love, drama, deception, suspense, and restoration. A winner will receive a paperback copy of one of the three books in the series, Trouble In Paradise, Vengeful Intentions or For Better And Worse by leaving a comment or email entry. Once the comment is posted Stephanie has asked that you subscribe to her monthly newsletter. Link here. The winner will be highlighted on a blog post on Stephanie's website. Giveaway ends 11:59pm EST November 23rd. Please supply your email in the post. You may use spaces or full text for security. (ex. jsmith at gmail dot com) If you do not wish to supply your email, or have trouble posting, please email maureen@justromanticsuspense.com with a subject title of JRS GIVEAWAY to be entered in the current giveaway. Danielle is sure obsessive with Joshua. I hope she finds her HEA ending with Greg. I would love to read this book just to follow Danielle's journey to happiness.